Get along to Galabank tonight and support the kids as they take part in their annual Penalty Shootout fundraiser in aid of the community football programme. Kick Off is 6PM with all kids from all age groups taking part. People are reminded that parking is available at the top end of the club behind the MUGA training area. Annan Athletics match against Clyde on Saturday 30th November may have been rescheduled due to Clyde’s involvement in the Scottish Cup 5th round, however, the Blackand Golds were still represented on the day at Broadwood through the community football 2006 Youth squad. The boys were delighted to be asked to participate against the Clyde FC Youths in what was a return match as the Bully Wee had previously visited Galabank inSeptember when the Clyde SPFL side ran out 2-1 winners. A commemorative gift was given to Clyde from Annan Coach Charlie McCulloch as a token of appreciation and also highlighting the friendship between the two clubs. The boys played for around two hours before receiving hospitality from the hosts. The teams then played again at half time providing the entertainment for Clyde and Stranraer fans. First team Manager Jim Chapman then paid a surprise visit to the boys before taking his seat in the stand to watch Clyde for the forthcoming Annan game. The day ended on the park after the game for photos then and in typical football tradition, stopped at Abington Services for their happy meal on the way home. The following Sunday morning seen the 2005 and 2006 squads playing in a Fun Fours and Fun Fives football tournament at Galabank. There were over 140 youngsters playing in these tournaments from Dumfries, Moffat, Lockerbie and Annan. Coaches Keith Maxwell (2005) and Charlie McCulloch(2006)were highly delighted by the turnout from players and parents. Such was the success of the tournament that the club will be are now looking to host another tournament in the near future. The fundraising draw and family disco raised over £600. Big thanks to Gillian, Suzy, Janice and Kelly for their hard work and to everyone who bought raffle tickets and to all the local businesses who donated prizes. Thanks also to James Cairns of Top Tunes Disco. Elaine Milne of Annan Properties, Ronnie Ogilvie, Sean Marshall, Archie Dryburgh and Dr Elaine Murray MSP of Scottish Labour Party Group for providing playing kit for P4 and P7. Every child taking part will receive a medal and a Selection Box. Make sure you don’t miss out and lets see your skill at penalties, crossbar challenge, dribbling etc . Thanks to all parents who have assisted in collecting weekly fees. This is very much appreciated and frees up the coaches to ensure the kids get maximum time on the pitch. Anyone able to assist at anytime please contact Brian Jardine. Training will continue throughout winter (except christmas break) however; if you feel the weather may affect training please check the AAFC website/Facebook page or contact your child’s coach or Brian Jardine before travelling. A huge thank you to all the responsible parents who are adhering to the parking restrictions around the ground. Annan Athletic FC are working hard with Police Scotland, The Scouts and the local authority to try and ensure your child’s safety when attending the club particularly on training nights. For those unfamiliar with the ground layout there is a large free carpark located at the north end of the ground which should be used whenever possible. Training sessions will finish on Monday 16 December after the Soccer Skills Challenge and start again on Monday 20 Januray 2014. Children will be required to register and pay before entering the Playing Surface. This will take place in the yellow cabin on entry to the ground. We would ask that all children arrive promptly (approx. 10 mins before starting time) to ensure that they have registered and paid and in place ready for training. We are always requiring help with coaching, setting up pitches or fund raising, if you feel you can help out or you require any more information please contact Brian Jardine on 07710368036 or Chris Bell on 07584131858, any help will be much appreciated. Training sessions will continue as normal throughout the October school holidays. 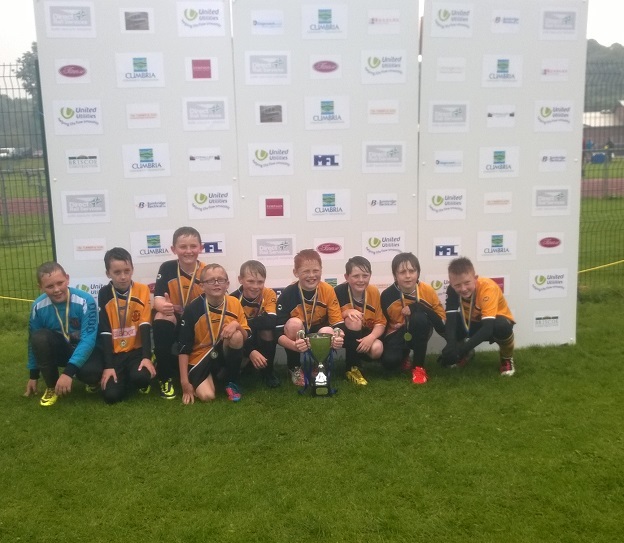 Annan Athletic FC 2006 squad travelled to Prestwick to take part in the Caledonian Festival recently. Coach Charlie McCulloch was delighted with their efforts stating “the boys were fantastic it was their first proper away day on the team bus and they were a credit to themselves and the club. We entered 3 teams, playing against teams from Ayrshire + Glasgow, and between them – 2 teams had 6 wins + 1 draw, and the other had 7 straight wins. Every single player scored. Could not have asked for more. The boys all had a great time as was confirmed by the noise of the bus on the way home”.